I hung at the back of the pack as we made our way up the slippery shale rock trail. I was dizzy and short of breath and mad at myself for skipping workouts and not eating better leading up to this hunt. 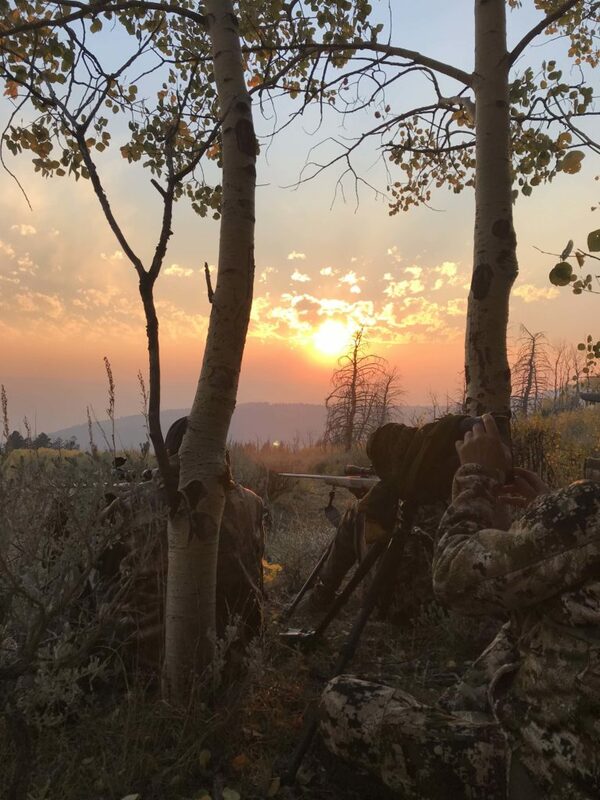 It was the sixth night of hiking an average of 6 miles into the areas we were hunting each morning and every evening since we had made it to the Utah High Country. My role as the caboose of this train of hunters had certainly become the norm. The altitude was giving me a run for my money and every day I was just hoping that I would acclimate and this high country hangover would subside! The morning before had been a rough one for Cade as well. The bumpy truck ride to the trailhead and the nausea of altitude sickness had us stopping to let him have a moment in the bushes a handful of times. We were hunting above 10,000 feet elevation. We live at 13 feet. 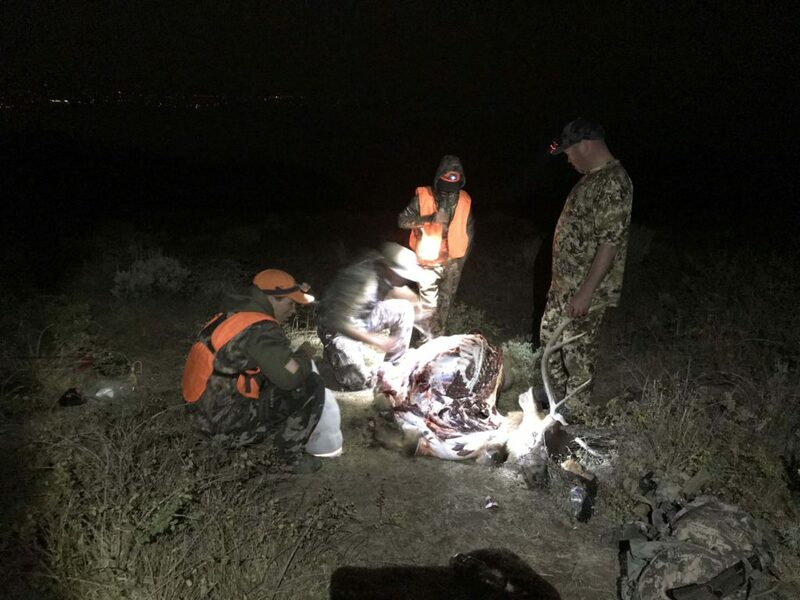 We are flatlanders in every sense of the word and this hunt was obviously going to push our limits every step of the way. Quinn and Casey felt it as well, but luckily they were handling it a lot better than Cade and I were. Nonetheless, we were grinding it out, and on that sixth night in particular, I wasn’t even sure if it was the altitude kicking my bum as much as it was the “parent nerves”. If you’re a parent I know you know the feeling. It’s the same feeling you get when their baseball team is losing by 4 and its your kid who is up to bat with the bases loaded while you are biting every nail you have down to nothing in the stands. Or the feeling you get when its time for them to give the election speech they have been tirelessly working on and you close your eyes and mumble every memorized word to yourself while crossing all of your fingers and toes from your seat in the crowd. Yeah, that same feeling, but multiplied by 20! So many nerves, “parent nerves”! Cade, Casey and good friend Tom had hiked into this same area early that morning. Well before the sun rose, they were two thirds of their way up the trail when they spotted a handful of bulls in the far distance through the thick trees. It was the same group of bulls we had watched through the spotting scope feed out onto the same flat a couple evenings prior and a few miles away, only this time they were in shooting range. The three of them had quickly tried to make their way into the clearing where Cade could get set up, but it was too late. 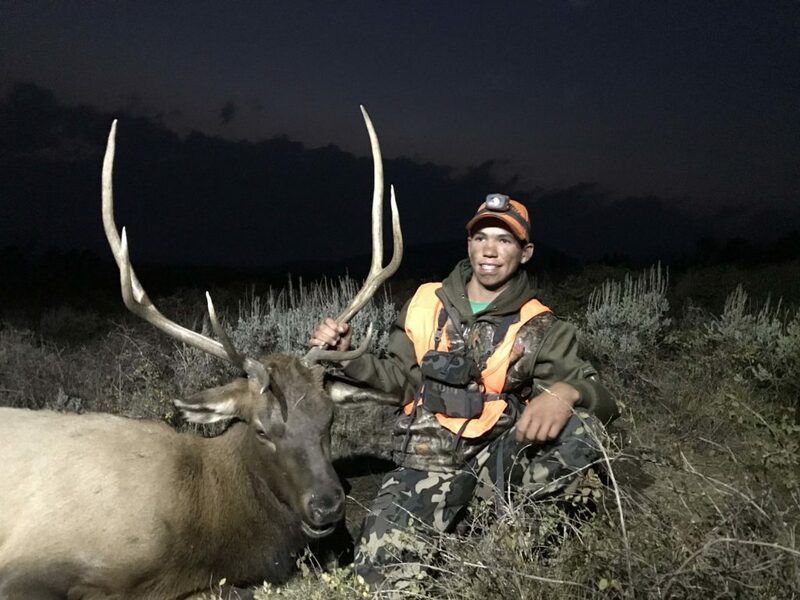 At first light the bulls quickly fed into the dark timber, but not before they all caught a glimpse of a heavy six point herd bull, Cade dubbed Torzo. Hearing the story upon their return to camp that morning, and now knowing that the same group of bulls had fed into and out of the same area, gave us all a new found hope and sense of excitement for what the evening might hold. We were all certain that those bulls would do the exact same thing. We just needed to be set up and ready this time. The anticipation of this all playing out exactly how we wanted, was enough for my “parent nerves” to be in full effect. We had already put a lot of miles and a ton of heart into this hunt. After several days of tough hunting, zero bugling and a perfect set up fail us days earlier, my Momma heart wasn’t sure I could take another let down quite like the one we had experienced a few days before. I wanted each of them to punch their tag so badly that I could taste it and as we hiked the 127 floors of stairs (according to my apple health app) of that shale rock trail, I was praying the rosary to calm my nerves for sure. It was just about 5 O’Clock when we reached the top of the flat. We quietly creeped along the edge in the treeline to find the perfect spot to get the kids set up and ready. 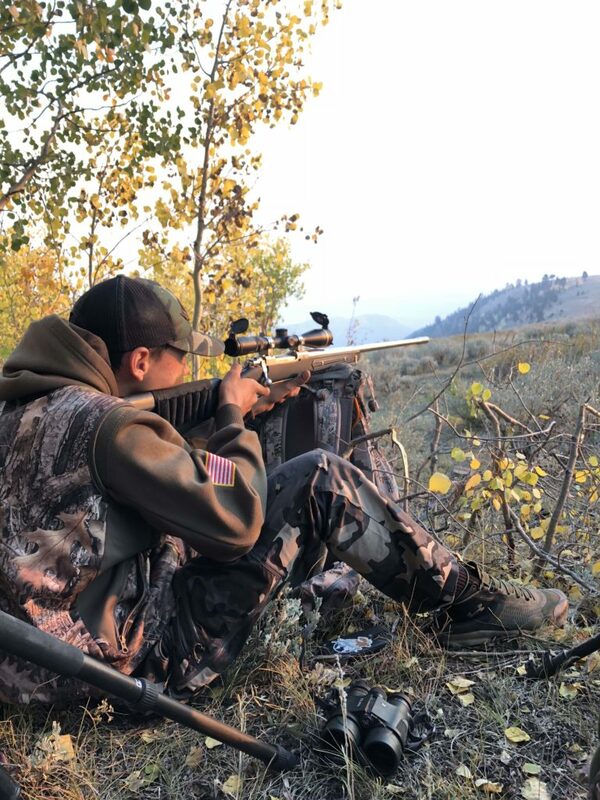 Quinn was set up on her shooting sticks and Cade was holding his rifle steady on top of the big pack, both kids had a solid aspen behind their back. All was good. Everyone had great visibility and felt steady and ready. Now we wait, barely whispering a dozen words to each other, simply sitting and listening to the sounds of nature come to life around us. Nearly two and a half hours had passed, when suddenly we heard the slipping and crunching of shale rock on the trail we had come in on. My heart literally jolted in my chest when I realized what I was hearing and the vein in Casey’s neck that immediately bulges out when he is irate, had surfaced. ATV’s where coming down the trail! As they came closer to the area we had so carefully and quietly hiked into, the more panicked we became! They were going to drive right though the area we had patterned the bulls coming in and out of! Casey, Tom and I all quickly got up and walked up the trail, in hopes that the ATV Riders would see us and move on. Once they saw us, they shut off their bikes and sat and glassed from their view point. We went back into our hiding spot in the trees and hoped that they wouldn’t see the bulls before we did, if at all. Five minutes later they started their bikes and continued on their way, away from us but still just as disturbing. I sat back down against a tree and closed my eyes in disappointment. For the love of public lands!!!! I know its all part of the game, but why this night. We weren’t even sure if the ATV riders were hunting. I admit I had pretty much thrown this hunt out the door. The sun had just about settled behind the mountain and it is was only about a half hour longer we would have to sit there until we could make our way back out of the flat up that crazy hard trail in the dark. I decided I would stand and stretch a bit before settling in for the last half hour of our sit. My hips felt like they were 90 years old and I was dreading that hike out. As I slowly stood and turned to stretch, I suddenly glimpsed the movement of a cow coming out of the patch! I literally almost jumped on Tom, telling him “they are coming”!! He quickly got Cade set up with the cow in his sights! “Cade! It’s a cow!” I remember loudly whispering over and over again! Cade was on her and more than willing to fill his hair tag with a cow. I wanted more for him though and so did Tom! Every bit of me was hoping he would wait, even if nothing else came out. Suddenly Tom and I both noticed a second elk moving out after the cow. It was a bull and he was moving across the knob we were sitting but just below us. It was tough to see him without rising to our knees, but our excitement at spotting him was enough for Cade to wait on pulling the trigger on the cow. I knew it would be only seconds that Quinn would be able to see him in her sights, if at all. Casey was coaching her along and although only a few minutes had passed, we were quickly losing the light of day and shooting hours were coming to a close. If something was going to happen tonight, it needed to happen fast. There was no time to wait and see if Torzo and the rest of the group of bulls would show themselves. We needed to get one bull on the ground! Just as Quinn was able to get the bull in her sights, Cade, very calm and cool announced that he had a good shot and he was given the go ahead to shoot. The boom of his .338 and the smack of his hit was like music to our ears! 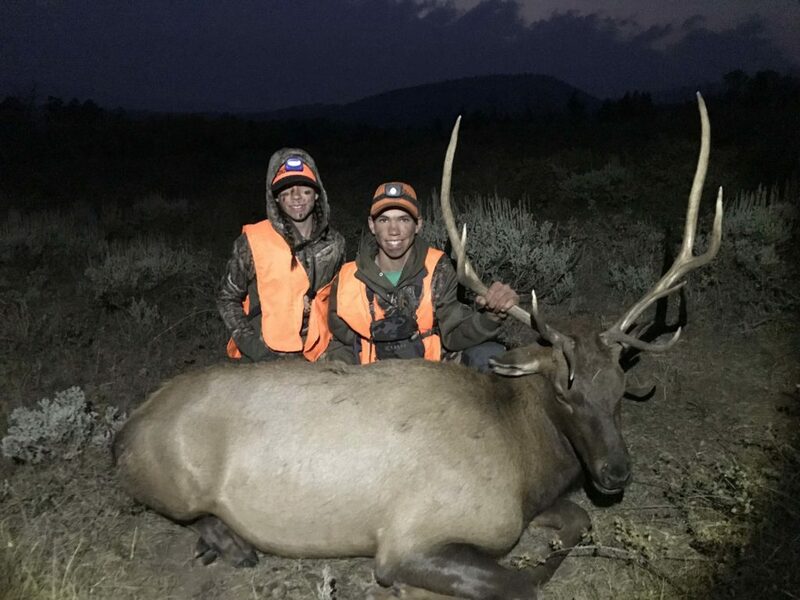 Cade and Quinn each drew Utah Youth Any Bull Elk Tags. 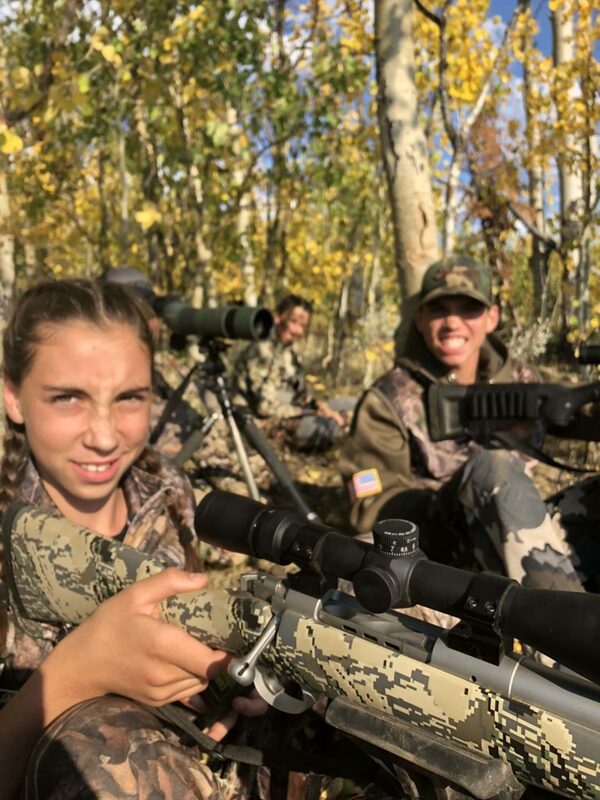 Which means they were able to hunt any general bull elk unit within the state of Utah during the youth only season from September 15 – 23, 2018. Only 500 youth tags are allocated each year. For more information about youth big game hunting tags, let me know or sign up for our Legacy Hunting Adventures email notifications here. I was praying Cade and Quinn would bag their elk. This story brought tears to my eyes and made me smile the whole way through! So awesome! !